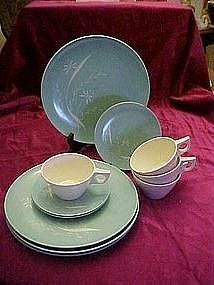 This retro melmac set consists of 4 dinner plates, 2 salad plates, 1 saucer, and 4 cups, as pictured. No staining. Minor scratches on plates from normal wear. No discoloration. Great to add to your existing set or a good start for a beginner.